For those who do not know me personally, and I’m sure there are many of you out there, I [Ron Trembath] have been contributing to FensePost for over a year and a half now. What might be the real surprise is that I am also a member of the United States Air Force. I usually tend to leave the bill paying job apart from my contributions here, but I recently found the two worlds intertwined when I came upon the chance to have a sit down with singer/songwriter Jenny Boyle, in what I must refer to as an undisclosed location in Southwest Asia, where I have called home since January of this year. Risking any plight by joining the two worlds for this interview was absolutely worth it considering all the wonderful things Boyle and her band have done to entertain me and my fellow comrades throughout the “undisclosed” world. Jenny Boyle hails from the northern sections of Virginia, but now calls Baltimore her home (Fells Point to rep specifically!). On the east coast, Jenny lives the life of an OR Nurse by day and a rocking, bar hopping songstress peddling around sweet and harmonic, R&B driven pop music by night. But, for what is now her 8th trip overseas, when she comes across the pond – she is a Star! 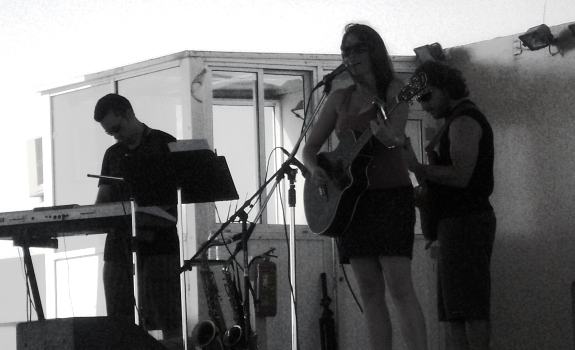 Jenny, and her band of extremely talented and hand selected jazz/rock musicians. Whether she is playing her heart out in Fells Point, Maryland, or performing for hundreds at a time overseas, her voice echoes with talent and her passion to entertain is without a doubt, inspiring to say the least. One of Jenny’s most personal tracks, “World of Dust” is a harrowing descriptor of what she saw in her time in the midst of the modern day battlefields. But the majority of her original work is more uplifting and pop oriented. Her 2006 debut album, Life in Mosaic, was well received by critics and audiences alike. On Tap magazine could not have been more spot on when they praised Boyle as having, a sultry voice and soulful riffs. The Jenny Boyle Band will be releasing a new album in the in the near future. “The new album is going to be a bit more R&B and rock oriented. A bit less pop than the first record. But, not completely withdrawn though,” Boyle mentions. As a songwriter, there are certain inspirations that are obvious within her songs. Love is a common theme. The corresponding loss that sometimes follows it is there as well. “It’s easy to write a song with no real meaning or emotion that is appealing. But, it can be extremely challenging to make something entertaining, yet personal. I like that,” Jenny pronounced with an excitement in her eyes one can hope she never loses. Although her songs are inspiring in themselves, it is her live performances that are by far the most captivating aspect of her life as a musician. Especially during her shows for the troops. Touring as an independent act has had its challenges, but in the end, Jenny will, in the sweetest stereotypical fashion, admit that it is absolutely worth it, and that the troops without a doubt deserve a good time. Whether playing her own brand of pop, or covering the classics, audiences around the world have been left in awe by the talent that Jenny and her boys have unleashed upon them. Performing as Jenny & The Drivers or simply, The Jenny Boyle Band, our heroine has performed with the likes of Los Lobos and Drowning Pool. As well as teaming up with the always popular group of Cheerleaders from any professional sports team you could name, and a plethora of touring comedians. If you had asked Jenny Boyle in 2004 if she could have seen herself performing in front of so many troops, or to anyone by 2010, the inevitable response would be no. After a college degree studying voice, and a short stint trying to make it as a musician, Jenny called it quits to help nurse her mother for six months after a terrible car wreck nearly claimed her own, and her family’s life. She called it quits, and shifted her career over to becoming a nurse. But, not before Jenny’s father had the brilliant idea in telling her to apply to the Armed Forces Entertainment to play for the troops. Eventually she would receive the call. And, well, the rest is history. According to Jenny, the future will definitely consist of another tour, after she finishes her current tour of course. The inspiration and tremendous good times that Jenny Boyle has brought to tens of thousands of troops throughout the world is something few will ever do, or even have the guts to do, in their lifetime. It is great to see an artist that is as humble and dedicated to service as this lady. As a service member, I am extremely in awe of the passion she has shown in doing something as crazy as jumping on a C130 aircraft to sing a few songs for us. It is definitely an honor. Be sure to head over to Jenny’s WEBSITE for updates, and how to pick up a copy of Life in Mosaic. Fishboy Releases "Classic Creeps" Acoustic, Live and with a Tour Diary Comic! What a great piece about Jenny you have written! I would have to agree with all you have written in describing the essence of Jenny Boyle!From having worked with Jenny for 4 years, I can attest to her sincere devotion to all those serving in the US Armed Forces. She truly cares about each and everyone of you which is why she is so committed to doing whatever she can to make your days a little brighter, joyful and hopeful! I just wish more people were aware of this modest talented musician and woman.